students can use to create content, develop digital-age skills, and showcase their passion and talent. teachers can use in a variety of ways to facilitate and implement rich learning experiences. Wixie supports a range of learners by providing students with different tools and options that allow them to demonstrate their learning in a variety of ways. Students can use Wixie to demonstrate content knowledge, write stories to entertain, draw pictures to inform, or record their voice to persuade. Help students recognize their skills and preferences as learners by asking them to create diagrams, comics, book reviews, or video-like tutorials to demonstrate their learning. Wixie is a digital platform students use to show their learning. With Wixie, students don’t simply capture and curate, they create to learn. It doesn’t matter how old they are, or what subject they are learning, Wixie works across the curriculum and can be used for reading, writing, math, science, and social studies classes with primary, elementary, and middle school learners. In order to be full participants in today's rapidly-changing world, students need to be media producers, not just consumers. Asking students to create with digital tools provides an authentic opportunity for them to not only engage with curriculum content (3R's), but also build essential digital-age skills (4C's). Wixie makes it easy to create and share a range of digital communication products, and Wixie works online so student work can be shared instantly through a URL. As they work together to create products for use outside of their classrooms, they create a positive digital footprint and see first-hand the importance of digital citizenship. Wixie’s range of students tool also make it the perfect tool for project-based learning, where students work collaboratively to solve real world issues and problems. Collaborative project work prepares students for modern careers and citizenship, as most complex communal, social, and economic problems are solved by groups, not individuals. Students can collaborate in real-time on projects in Wixie using the Team feature. Students can begin a project and create a team of collaborators from other students in their class. Teachers are automatically added to these team projects and create team assignments as well. Every learner is unique. Wixie’s many tools and options provide a fun way for students to demonstrate their creativity and explore and share their passions, resulting in increased motivation and engagement. Whether you ask students to use Wixie’s tool to explore and demonstrate understanding of the curriculum or as the platform for showcasing their work in passion projects. Wixie is way more than a student application. Wixie includes a suite of teacher tools you can use to manage and support effective digital learning in your classroom. Explore the curriculum library for standards-based templates you can use during daily instruction for formative assessment purposes. You can also customize, create, and assign leveled activities you have differentiated by content, process, and/or product. You can even assign a blank project and connect a rubric with criteria for their work. Students can view the rubric or checklist as they are working to better understand goals and direction for their work. You can also comment on student’s projects as they are working to provide coaching to individual or team projects. Giving students choice is a great way to foster a culture of risk-taking, because it lets them know there is more than one right answer to a given task. A great way to start is with a choice board that includes suggestions they can choose for sharing content. Simply ask students to choose any 3 options for their project. You can also include one option that is open for their new idea. In order to transfer responsibility for learning to our students, provide them with a powerful prompt and help them envision things they can make or do to meet the goals of their project and showcase their learning. For example, if your goal is to get students to think deeply about the characters in the books you are reading, let students choose how they will share their thinking with you so you can evaluate their comprehension. Your students will surprise you with their creativity. Making the options open can be a bit scary the first time, but once they get used to the responsibility, the risks disappear and they will amaze you with their work. In a project-based approach to learning, students are presented with a real issue or problem and learn content to solve it. The authoring possibilities for students make Wixie the perfect tool for project-based learning. With PBL, students may still create presentations, public service announcements, comics and other products, the difference is that they are responsible for choosing what product best helps them showcase their ideas and content. Wixie can also be used to support the process of creating rich PBL or STEM projects that require deep thinking. 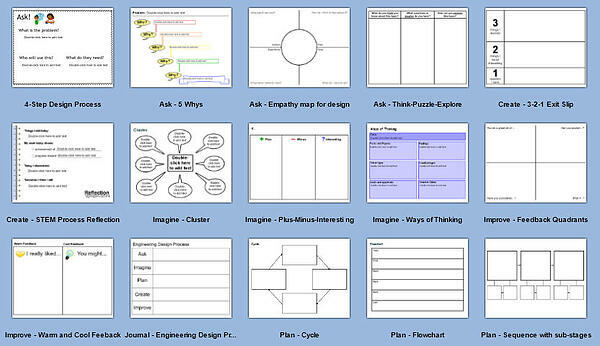 Whether you use a project-based, design-thinking, or engineering design process in your classroom, Wixie includes an entire folder of graphic organizers and thinking maps that can help you support student thinking and provide formative assessments throughout the process. Get started creating in your classroom! Wixie is on contract with the NYC DOE and available through FAMIS on ShopDOE. Download a flyer with purchasing details to help you get started. 6160 San Diego Mission Rd.